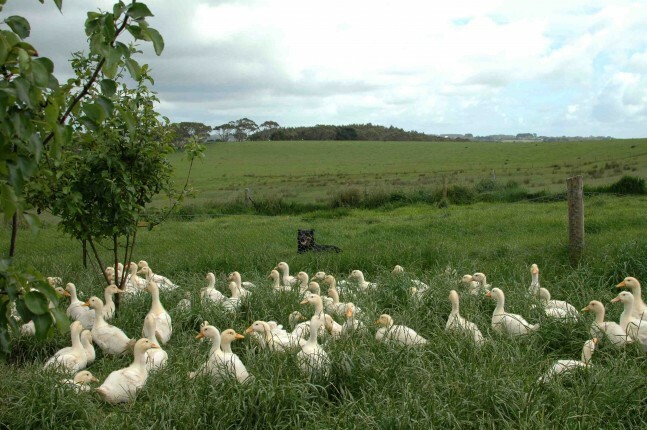 Home > Produce > Great Ocean Ducks – Wandering Ducks! Great Ocean Ducks – Wandering Ducks! Great Ocean Ducks and the Clarke’s endeavours has enormous appeal to the Wandering Palate’s ideology; artisan farmers, free-ranging birds or specifically ducks, heirloom breeds and animals reared in a humane way, a topic that is becoming increasingly pertinent. The Clarke’s are new to duck farming, indeed their venture is a product of an epiphany Greg had when on a travel writing assignment in the Sahara Desert back in 1996, deciding it was time to realise a long held dream of settling down in the countryside. It took another 10 years before the dream to come true and finally move permanently to their 16-hectare property, 6km out of Port Campbell, near the Twelve Apostles and Victoria’s Great Ocean Road. The Clarke’s began with 30 ducklings in 2009 and now produce around 100 ducks a month, most of which go to Melbourne’s top restaurants including Chef Andrew McConnell at Cumulus Inc., about as strong an endorsement comes in the culinary world of Melbourne and Australia. They raise mostly Aylesbury ducks, a classic English table duck that became famous in the 19th century for its unique pink bill and heralded as England’s finest white-skinned market duckling. Referencing my duck bible, “Raising Ducks” by Dave Holderread (Storey Publishing) they were in fact originally known as White English or Buckinghamshire “duckers”, and at the time it was thought these ducks could only be raised in the Vale of Aylesbury, 40 miles northwest of London, hence the name evolving to ‘Aylesbury’. Like all breeds of domestic birds, the Aylesbury duck also evolved in shape and size and although already prized for their “large size, ability to produce eggs in the winter months, fast growth, light bone, and a high-percentage of mild-flavoured meat when butchered at six to nine weeks age”, when poultry breeders at the time started to show their prized fowl, they tended to favour larger ducks with deeper keels, thus the Aylesbury has developed to a much bigger duck from its wild Mallard ancestry and now classified as a heavyweight breed. Holderread details, “At the first British poultry show held in 1845, two classes were provided for ducks, ‘Aylesbury or other white variety’ and ‘Any other variety’, such was the importance of the breed. I suddenly have this image of dining at Heston Blumenthal’s ‘Dinner’ www.dinnerbyheston.com with a Victorian era dish of whole roast Aylesbury Duck, and a bottle of Clos Vougeot 1846. Actually, one of the best duck meals I have had in memory was at the L’Auberge de l’Ill, in Illhaeusern, Alsace www.auberge-de-l-ill.com although some twenty years ago, but I vividly remember this huge roast duck with amazingly thick breast meat that we washed down with 1992 La Tache – those were the days! Incredible really; only a Three-Star Michelin restaurant of such professional stature and unparalleled pedigree would volunteer such information so readily, with genuine altruism – greatly appreciated. The Canette de Barbarie is a domesticated breed derived from the American wild Muscovy duck and is another heavyweight breed which explains our impressive whole roasted specimen at L’Auberge de l’Ill, moreover that it comes from the famous poultry region, Bresse. The Clarke’s have actually started rearing Pekin ducks as well, largely because they have had a lot of trouble hatching Aylesbury this year; stating their first delivery of Aylesbury to Cumulus (for some months) should be around 20 January. Centuries-old traditions were exclusive to the courts of Imperial China with their roots in the Yuan and Ming Dynasty’s; these royal methods evolving to what is believed the first restaurant specialising in Peking Duck, Bianyifung established in the Xianyukou, Qianmen area of Peking in 1416. Furthermore, the method of cooking the ducks in the Imperial courts was by open oven and using non-smoking hardwoods and it wasn’t until 1864 when Yang Quanren (楊全仁), the founder of Quanjude (全聚德) http://quanjude.com.cn/ in Beijing developed the hung oven to roast ducks and subsequently a more smoky-flavoured Peking Duck (Beijing Duck) as we know today. Back to things on a wildly smaller scale, Pekin ducks are what the Clarke’s are selling to their only retail outlet – Canning’s Free-Range Butchers in Hawthorn, Melbourne http://canningsfreerangebutchers.com.au. The Clarke’s shared with me that most of their ducks have good feeds of strawberries; “We live near a strawberry farm and they kindly offer us some of the fruit they cannot sell. We puree the strawberries and mix them in the water and the grain.” I am imagining that Great Ocean Road Pekin Ducks have this wonderful sweetness to their flesh! So folks, there you have it; Great Ocean Ducks are potentially the best ducks in Victoria, perhaps all Australia, and you should be heading immediately to Canning’s Free Range butcher to put your order in for a Pekin Duck, or booking a table at Cumulus Inc.